One of the fastest and easiest data loggers to download on the market! LogTag® products are designed to meet the growing demand for cost effective electronic environmental recording solutions. Combining state of the art technology, innovative design and high volume manufacturing techniques, the LogTag® system provides the most cost effective, high performance environmental data logging system available. 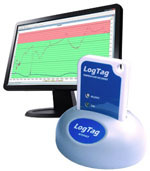 Using the LogTag Interface and LogTag’s freely available companion software LogTag Analyser, the LogTag is easily set-up for recording conditions including delayed start, sampling interval, number of readings, continuous or fixed number of readings and configuration of conditions to activate the ALERT indicator. Readings are downloaded using LogTag Analyser which provides facilities for charting, zooming, listing data statistics and allows exporting the data to other applications such as Excel. Please visit the LogTag Download Page to access user guides and download the LogTag Analyser Software. NOTE - This is just a sample of the loggers available, if you have special requirements please contact us and we will help you in deciding which logger is most suitable for your application. The LogTag Temperature Recorder incorporates a temperature sensor uniquely arranged in a recess in the case thereby providing the same integrated mechanical protection of an internally mounted sensor with the faster reaction time more associated with external temperature probes. This unique temperature sensor arrangement provides faster reaction time to temperature change. The UTRIX-16 stores real-time temperature readings over a measurement range of -25°C to +70°C with an accuracy of ±0.5°C, displays user-configurable alerts, and comes with an integrated, long-life USB connector. The UTRIX-16 is enclosed in the same robust and durable polycarbonate case common to other LogTag products. IEC 60529: IP64 with USB cap fitted. The LogTag® UTRID-16 provides a display to allow immediate viewing of current and past temperature and alarm statistics. The display shows recording status, current temperature, alarm status of up to six user-configurable alarms and duration of any temperature excursions. 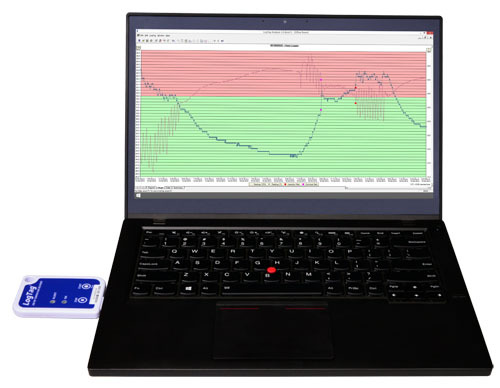 When the UTRID-16 is connected to a computer using the integrated USB plug, a detailed PDF report of the recorded temperature data and alarms can be automatically generated without the need for extra accessories and proprietary software. Can be "pre-set", you just have to press the start button! The LogTag humidity & temperature recorder has been designed to meet the growing demand for cost effective electronic temperature & humidity recording solutions. Combining state of the art technology, innovative design and high volume manufacturing techniques, the Logtag recorder system provides the most cost effective, high performance humidity data logging system available for today's market. One LogTag Analyser Software Starter Kit is required for operations. Combining the leading edge features of the standard LogTag with a highly reliable solid state humidity sensor means the The LogTag Humidity & Temperature Recorder is a leader in it's class. $100.00 per unit plus delivery and GST. Probe sold separately. The LogTag External Probe Temperature Recorder measures and stores up to 8000 temperature readings over -40°C to +99°C measurement range. Same features as the other LogTag loggers, the LogTag External temperature sensor recorder supports applications where a remote probe is required such as core temperature of cooking or cooling foodstuffs. 40mm x 3.2mm Stainless Steel Probe 1.5m Teflon cable: $75.00 plus delivery and GST. The LogTag TRID30-7 temperature recorder features a display together with a data logging function storing up to 7770 temperature readings. Statistical temperature and duration readings for up to 30 days can be reviewed on the display. The visual display of current temperature and previous alarms is an important feature in “static” applications such as cool rooms and refrigerators. The TRID30-7 can also be used in transit applications where a direct readout of the statistical data is required without use of a computer or readout device. $135.00 per unit plus delivery and GST. Probe sold separately. The LogTag® TRED30-16R Temperature Logger measures and stores up to 15,900 temperature readings over a -40°C to +99°C measurement range from an External Probe. The alarm is trigged if temperature readings are outside pre-set alarm limits. The status indicator changes from a to a and, if configured, the audible alarm will sound. The day marker will also appear if not already present. The alarm status indicator and audible alarm can be easily cleared, but the day marker remains to ensure a visible record of excursions is shown on the display. A simplified alarm clearance, stop & start procedure is available as an option. Details of any excursions in the preceding 30 days can be checked directly by inspecting the statistics history on the loggers display or in more detail by downloading the logged data via a standard LogTag® Interface cradle to LogTag® Analyzer operating software. The LogTag Dry Ice “Probe-less” Temperature Recorder operates, measures and stores up to 8000 temperature readings in temperature environments ranging from -80°C to +40°C (-112°F to +104°F). $140.00 per unit plus delivery and GST. Probe sold separately. The LogTag low temperature remote probe recorder measures and stores up to 8000 temperature readings over -80°C to +40°C (-112°F to +104°F) measurement range from associated interchangeable LogTag ST10 type remote probe temperature sensor (available in lengths up to 3 meters (9’10”)). The LogTag Wall Mount Bracket provides an easy and tidy solution to mounting a LogTag on a wall,door or vertical surface while still allowing easy removal of the LogTag for download etc.